However, the 18-year-old decided that he was ready to take the next step in his career signing his entry-level contract with the Senators and pursue his dream of playing in the NHL. Fortunately for him he has a good support group to lean on in his father, Keith Tkachuk, who played 20 seasons in the NHL, and brother, Matthew Tkachuk, who currently plays with the Calgary Flames. However, neither one would tell him where he should go. Instead, they made it clear that he needed to make this decision based on what he thought was the right fit for himself. 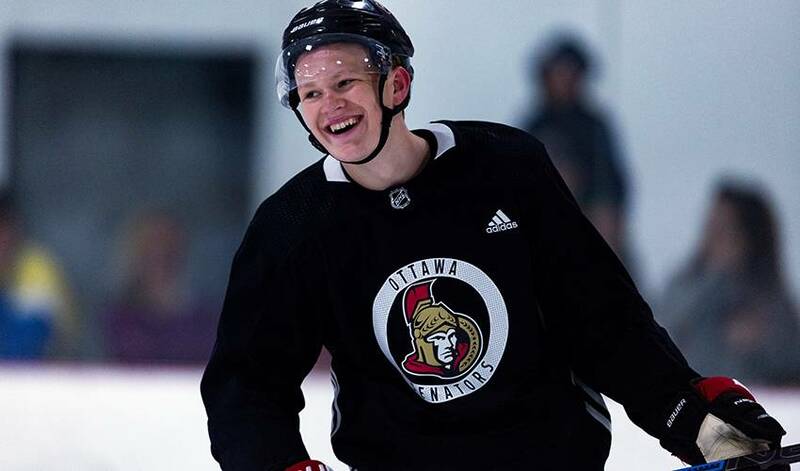 With his focus on making the Senators out of training camp, Tkachuk knew that he needed to take the next step in his training and preparation this summer to prepare for the tough grind of the NHL schedule. Many NHL players have gone to Roberts, the former NHL player with 1,224 NHL games and a Stanley Cup to his name. Since his retirement, the likes of Connor McDavid and Mark Scheifele have sought out his high-performance training platform for help in their offseason training, and a main reason why is because of his balanced approach to nutrition and exercise – something Tkachuk feels he has benefitted from. Senators players like Matt Duchene, Mark Stone and Mark Borowiecki have already started to reach out to Tkachuk, which he appreciated, and he is excited to move up to Ottawa and meet them for the first time while hoping to help turn things around in Ottawa. He’s also talked with head coach Guy Boucher and knows that the Senators want to incorporate more younger players in the lineup but Tkachuk knows it won’t be easy. Matthew Tkachuk, closing in on his 100th NHL game, stopped by NHLPA.com to deliver his Top 5 hockey idols. No need to guess which former big-league star topped his list, but you may be surprised by some of his house guests over the years! He’s one of hockey’s most intense players, but don’t expect the quite the same competitive display from Matthew Tkachuk when he serves up his best shot at the Smashfest Charity Ping-Pong Challenge.